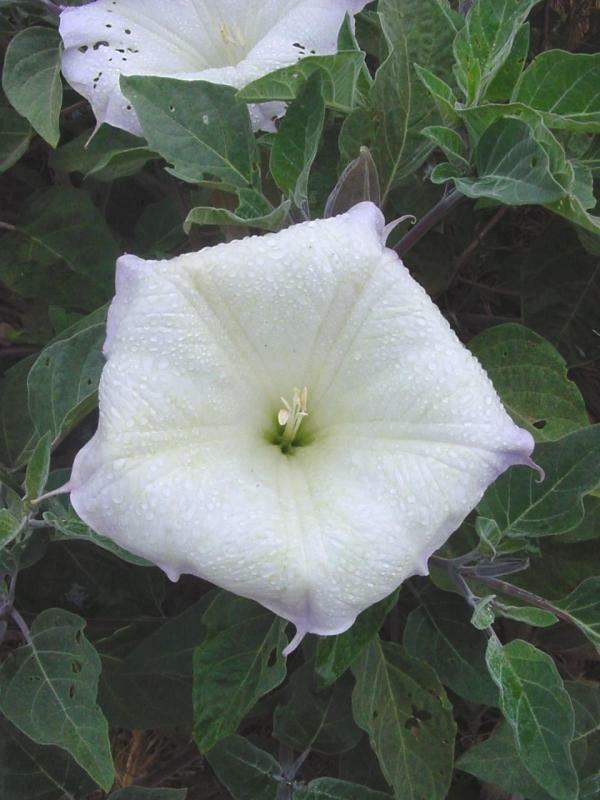 Sacred datura has been called by many names, among which are tolguacha, thorn-apple and western jimsonweed, but I just usually refer to it as datura. 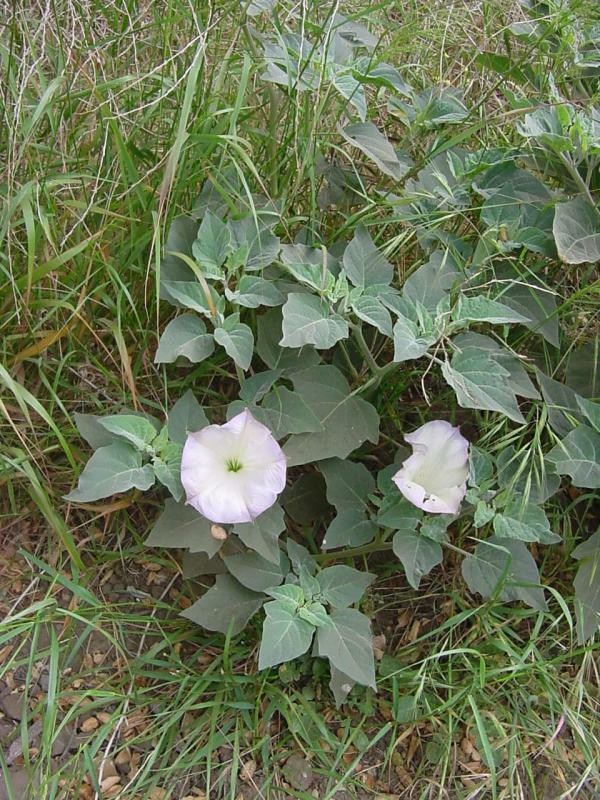 Like other members of the nightshade family, this plant is highly toxic. It is a somewhat erect, widely-branched, coarse perennial with grayish-pubescent herbage and 2'-4' long stems. The leaves are alternate, ovate, slightly wavy-margined and unequal at the base. The flowers are large, showy, erect to nodding, solitary in the leaf axils and colored a pale lavender to white or off-white. The calyx is tubular to 4" long, ribbed toward the base, and with short lobes. The corolla is funnelform and flaring 2"- 8" wide with five subulate teeth. The fruit is globose to 1-1/2" in diameter, densely prickly and nodding, and contains large, tan-colored seeds. 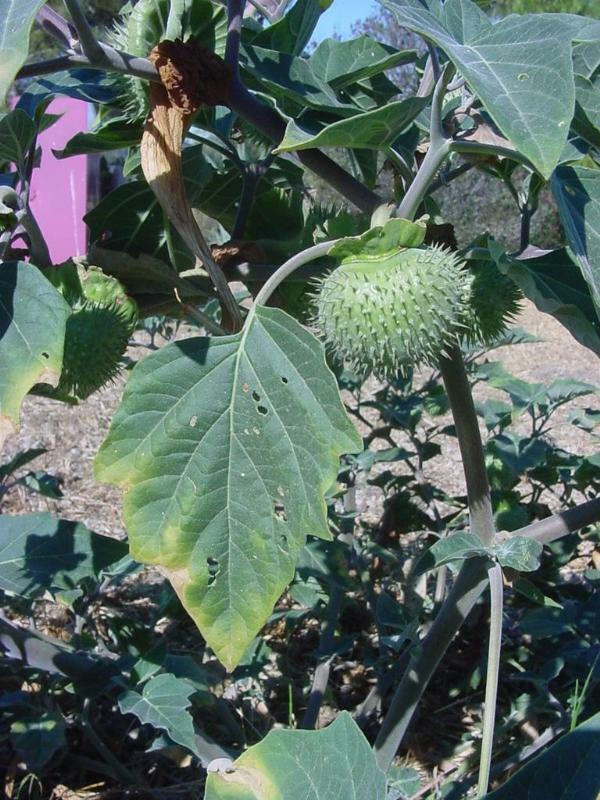 Datura is found in both cismontane and desert areas, dry open and sandy places to 4000' in coastal sage scrub, valley grassland, creosote bush scrub and joshua tree woodland in most of the California Floristic Province. 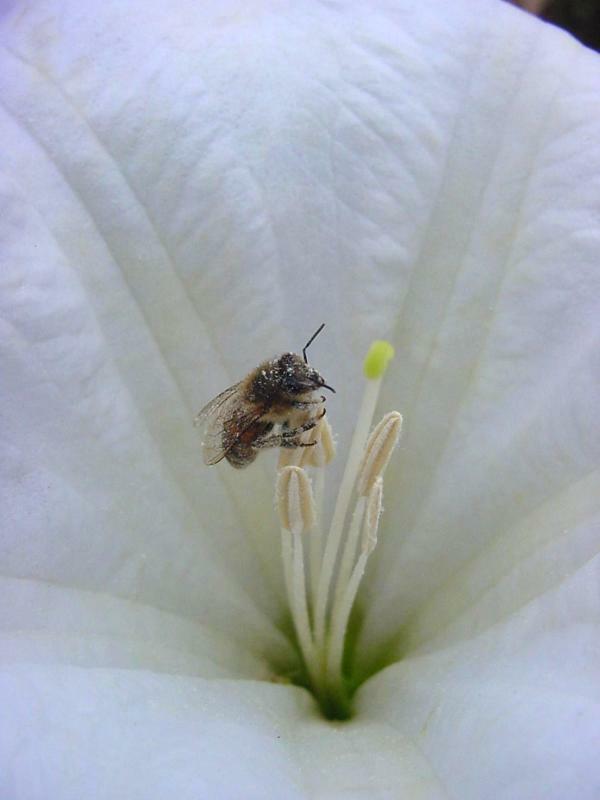 It is very common and blooms from April to October. 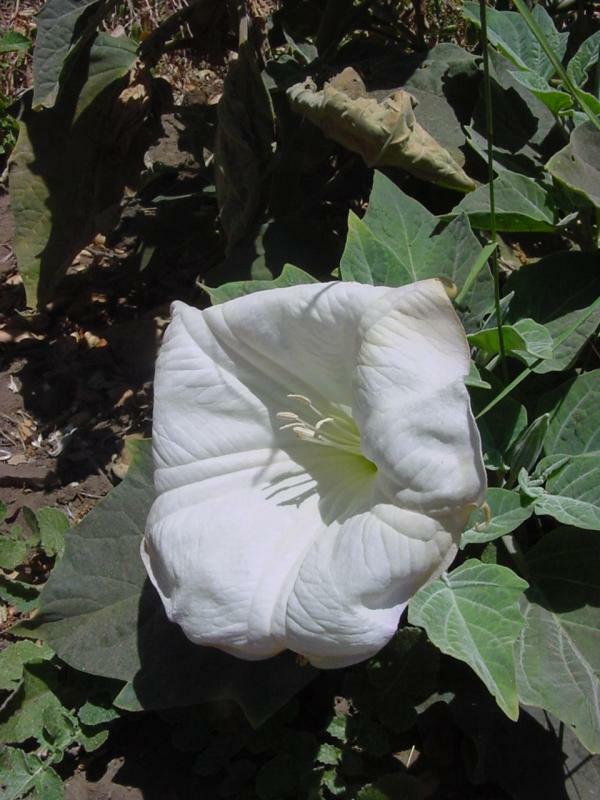 It is a native and can be distinguished from its introduced close relative, Datura stramonium, by its fruit (stramonium has erect ovoid capsules) and the size of the flowers (stramonium has flowers only up to 2" across). 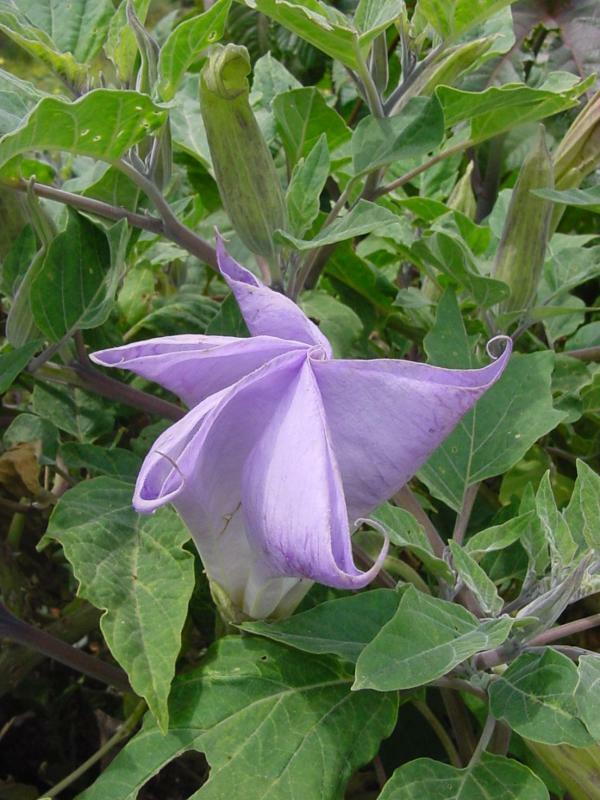 Click here for Latin name derivations: 1) Datura 2) wrightii.